taken crver and installed in one of the laboratories of the Bureau. is absolutely necessary. It took the better part of an entire year to accomplish the work as it has been described. 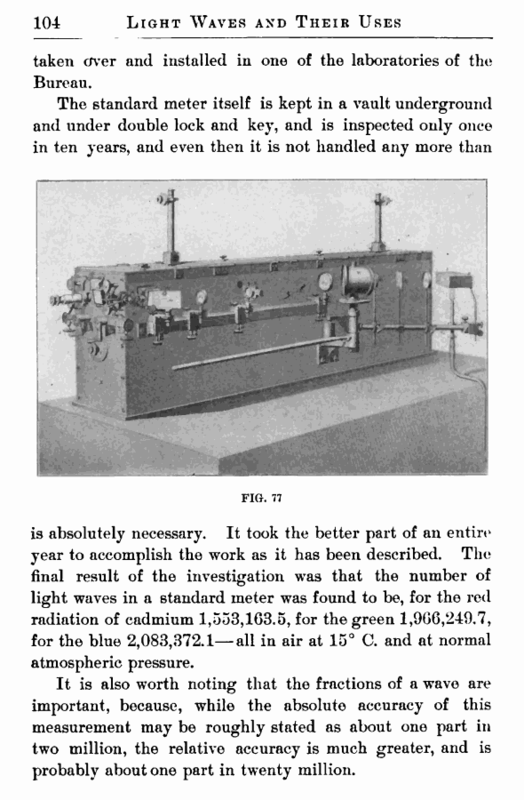 The final result of the investigation was that the number of light waves in a standard meter was found to be, for the red radiation of cadmium 1,553,163.5, for the green 1,966,249.7, for the blue 2,083,372.1—all in air at 15° C. and at normal atmospheric pressure. It is also worth noting that the fractions of a wave are important, because, while the absolute accuracy of this measurement may be roughly stated as about one part in two million, the relative accuracy is much greater, and is probably about one part in twenty million. The question may be asked: What is the object of making such determinations, when we know that the standard itself would not change by any amount which would vitiate any ordinary measurements ? The reply would be that, while the care taken of the standards is pretty sure to secure them from any serious accident, yet we have no means of knowing that any of these standards are not going through some slow process of change, on account of a gradual rearrangement of the molecules. 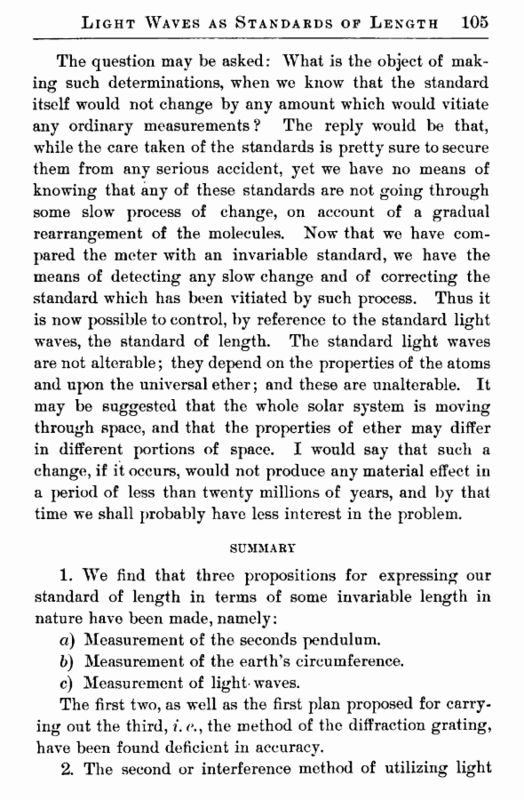 Now that we have compared the meter with an invariable standard, we have the means of detecting any slow change and of correcting the standard which has been vitiated by such process. Thus it is now possible to control, by reference to the standard light waves, the standard of length. The standard light waves are not alterable; they depend on the properties of the atoms and upon the universal ether; and these are unalterable. It may be suggested that the whole solar system is moving through space, and that the properties of ether may differ in different portions of space. I would say that such a change, if it occurs, would not produce any material effect in a period of less than twenty millions of years, and by that time we shall probably have less interest in the problem. а) Measurement of the seconds pendulum. б) Measurement of the earth's circumference. c) Measurement of light* waves. The first two, as well as the first plan proposed for carrying out the third, i. the method of the diffraction grating, have been found deficient in accuracy.